Students rallied outside an MTA public hearing to protest the elimination of student MetroCards. A flood of outraged residents and elected officials lined up to voice their concerns to MTA board members last night at a public hearing at the Paradise Theater on the Grand Concourse. The transit agency has proposed drastic service cuts and fare changes to cover it’s nearly $400 million budget shortfall. Speakers at the hearing conveyed their anger as well as a sense of déjà vu, having made the same pleas to stop service cuts last year, when the MTA faced a similar deficit. Some of the most troubling changes stemmed from the proposed elimination of student MetroCards—which provide three free rides on school days—as well as reduced Access-a-Ride service for the disabled and elderly and the discontinuation of the Bx18 bus, which runs between Undercliff Avenue and the Grand Concourse. Borough President Rueben Diaz, Jr. was the first to take the podium, telling MTA chairman Jay Walder and other board members that they were underestimating the role mass transit plays in the lives of Bronx residents, the majority of whom don’t have access to a car. His testimony was followed by similar speeches from Council Members James Vacca and Oliver Koppell, Assembly members Jeffrey Dinowitz and Vanesssa Gibson, and representatives from the offices of several other Bronx officials. A seemingly endless line of residents approached the microphone with stories of transit woes: the high school student who gets up at 5 a.m. to take two buses to get to school on time; the disabled woman who relies on Access-a-Ride to get to her doctor appointments in Brooklyn. Verna Montgomery, who runs a nonprofit sports club for kids in Morris Heights, said she was worried the loss of free rides to school would encourage students to skip class more often. If the cuts go through, full-fare student MetroCards would be discontinued starting this September and replaced with half-fare cards—which would then be phased out in September 2011. Students from Sistas and Brothas United, a youth group associated with the Northwest Bronx Community and Clergy Coalition, protested outside the public hearing. 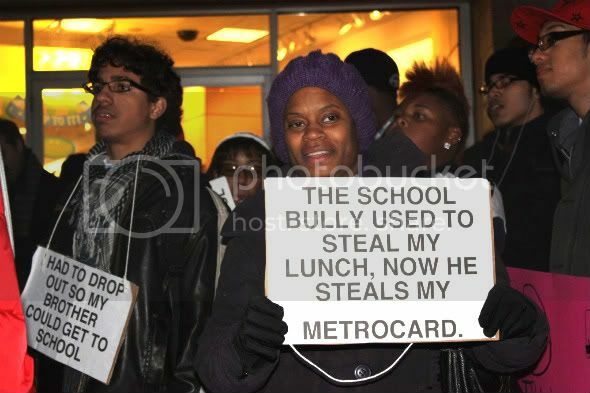 “We’re ready to go to war for our MetroCards,” one student said. In addition to the end of the Bx18 bus, the MTA wants to discontinue off-peak and Saturday services on the Bx20, cut off weekend service on the Bx33 and Bx34, and discontinue summer service to Baretto Point Park Pool. A full list of proposed changes can be found here. Several speakers offered solutions for how the MTA could close their budget gap without cutting service. Some said MTA employees should give up their bonuses and transit passes while others called on city and state government to step up their funding efforts. Either way, the crowd was unanimous in their contempt for the changes. Labels: Bronx subways and buses, bronx transit, Jeff Dinowitz, MTA cuts, public hearing, ruben diaz jr.